As a native of the lovely seaside town of Bray in Co. Wicklow (also the birthplace of other luminaries like Dara O'Briain and Katie Taylor), one of my favourite places for a drink is the The Harbour Bar. Tucked away under the railway bridge and overlooking the harbour, it's always been a little out of the way from the busy seafront but a hidden gem. If the pub could talk, I'd be running into witness protection as it's been the venue for many happy and slightly inebriated occasions over the years. At one stage, it would have been simpler to have my wages paid directly to the pub as I was never out of the place! Time passes and we've both moved on, me out of Bray as house prices rose out of my reach, and the Harbour from the O'Toole family to new owners who have transformed it from a shabby, cosy, "we only do crisps and bacon fries" old pub to a equally shabby & cosy pub with great bands, food and beer. 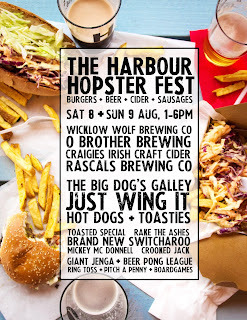 This weekend, the Harbour Hopster Fest is happening on Saturday 8th & Sunday 9th August to celebrate their love of craft beers and delicious grub. 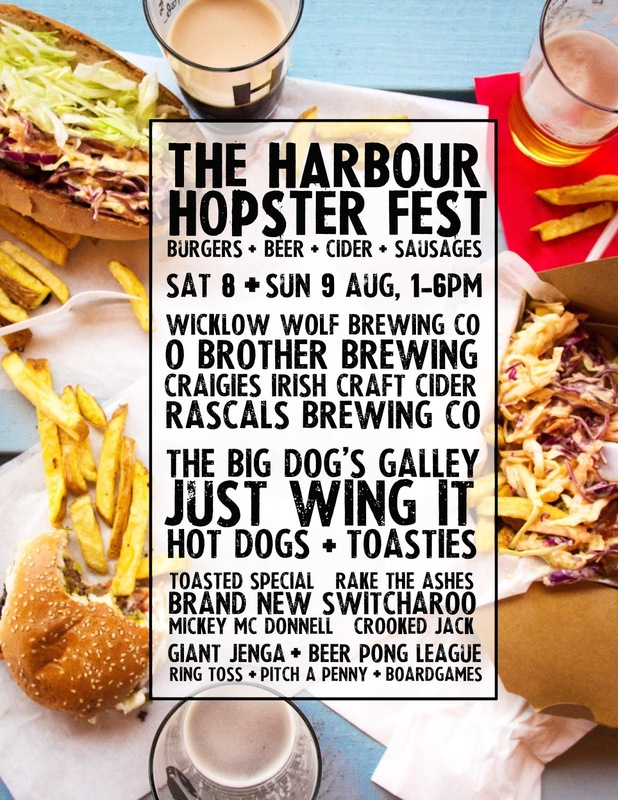 There's brews from locals The Wicklow Wolf Brewing Company and O Brother Brewing, food from The Big Dog's Gallery and Just wing it, loads of lovely music including Rake the Ashes & Brand New Switcheroo. Not into music? Regress to your childhood with games like giant Jenga, Pitch-a-Penny and Ring Toss. Why not head down for a weekend of fabulous food & drink and some great music? It's a 2 minute walk from Bray Dart Station so you can leave the car at home and really enjoy yourself.